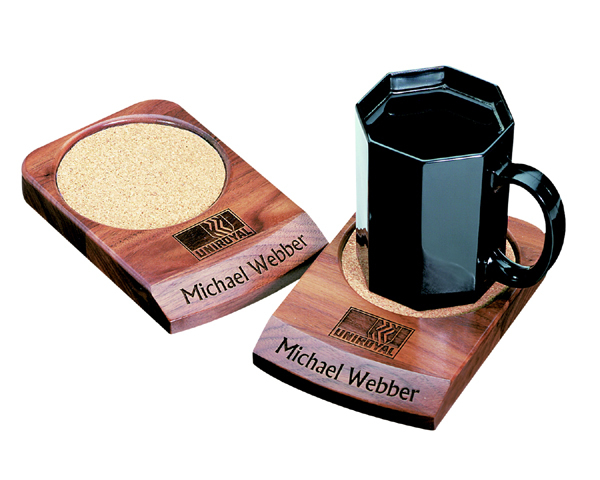 Wood Coaster | Promotional Wood Coasters imprinted with your logo. Wood Coaster is great for large mugs.This large coaster will handle the larger coffee mugs as well as the traditional sizes. The top area is ideal for a logo or slogan, while the rounded bevel provides a perfect spot for personalization. The recessed area has a cork bottom. 6 x 4 x 3/4"
Price includes one laser engraved imprint in one location. A set-up charge is an additional $55.00 per location. Multiple locations are available at $0.90 each per location. Personalization is available at $4.00 per name.